I hate junk mail. H.A.T.E. I.T.! Lately I’ve been inundated with credit card offers. See the pic to the right? See how happy I am? Yes, I’m being sarcastic. That is all the credit card offers that I received over the span of one short week. 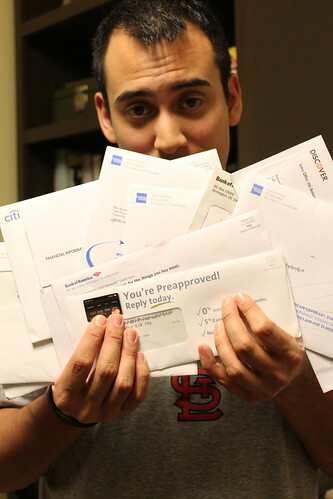 In all, I received about 2.5 credit card offers for each day! How freakin’ ridiculous is that? 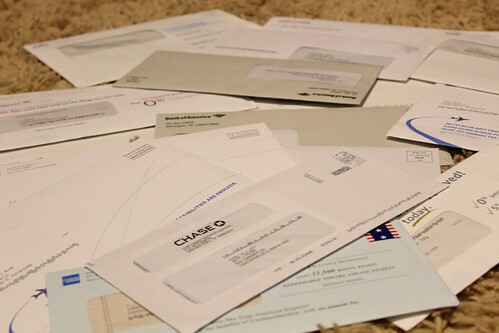 Wanting to stop the junk mail, I asked Miranda to write up a post helping you opt out of your prescreened credit card offers and any other junk mail that pollutes your inbox. You can thank me later….. I have been receiving large numbers of prescreened credit card offers recently. In fact, my mailbox often comes stuffed with three offers from the same credit card issuer: One for me, one for my husband, and one for my business. The result is a great deal of clutter that builds up as I throw all these offers in a pile until I have time to open and shred them all. Other types of financial clutter also end up lying around: “Last chance” offers for special FHA loan refinancing, letters insisting that I can save money on my car insurance premiums, and other marketing materials fill my mailbox. And that’s just the mail. I could spend hours of my time on the phone with telemarketers and scammers if I didn’t screen my incoming calls. But there are easier ways to avoid much this financial clutter in my life. Indeed, I just spent a few minutes hopefully reducing the financial clutter I can expect to receive in the future. OptOutPrescreen.com: Consumer reporting agencies sell information about your credit history to credit card issuers and others. However, if you don’t want to receive these prescreened offers, you can visit this site, which is the official site of the consumer credit reporting industry. Fill out the information, and the clutter in your mailbox should be reduced significantly. DMAchoice.org: You can reduce the marketing mail you receive by opting out at this web site. The Direct Marketing Association is a large body of marketers. By opting out at this site, you can be taken off a number of lists. You can opt out of direct mail, as well as commercial email. However, this is only effective with DMA members. Opt Out: This site can help you get off lists by providing you with information about to opt out of different marketing materials online, as well as how you can generate your own forms for those companies that don’t have online opt out options. National Do Not Call Registry: This is for those of you who don’t want to be bothered by the way phone calls clutter up your time. Now, the Registry is permanent, so you don’t have to keep registering every couple of years. Realize, though, that if you are a customer of an institution, or if you have donated to a charity, these organizations can call you even if you are on the list. While these sites can help you reduce your clutter and avoid junk mail, it is important to realize that scammers and spammers might not care about your status. Indeed, scammers will still try to call you, or mail you, no matter your status. And, not everyone is part of the opt-out movement. But if you focus on the sites above, you should see a reduction in your clutter. It is certainly easier to take steps yourself to be eliminated from the marketing lists and use your personal information more carefully than tossing all the junk mail on your coffee table in hopes of shredding it when you have time. We will include a summary of the article on April 23, 2012. We will appreciate if you can link to the summary. Thanks for this guide – very handy stuff, especially for those who get freaked out about these offers (like when they show up on your credit report). That’s also very funny about the fake director. Nuts to that. I think those credit card guys are overdue for a version of that Verizon CEO megaphone prank. I get this crap in the mail every day. I’m going to check out the sites you mentioned so I can get off all of these junk mailing lists. It’s taking up too much room in our bill drawer anyway! Wow!!! I thought I got a lot of credit cad offers…that is crazy. Thanks for the info on he to stop the madness. The one piece of mail I hate the most are letters that look like a bill but are really just trying to get you to sign up for something. I’ve even lucky enough to notice them, but I’m sure there are many people out there that mistake them for a bill and start paying.